For basketball player Chris Richardson, see Chris Richardson (basketball). Christopher Michael "Chris" Richardson (born February 19, 1984) is an American singer-songwriter who was the fifth-place finalist on the sixth season of American Idol. Richardson was born in Supreme Headquarters Allied Powers Europe Hospital in Belgium to Phyllis and Danny Richardson. His father spent 20 years in the United States Air Force. Richardson moved to Chesapeake, Virginia, in 1999. 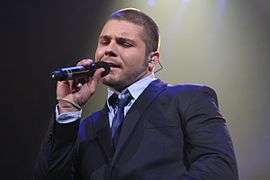 He admitted during the March 6, 2007 edition of American Idol that he used to be overweight as a child and teenager. He graduated from Great Bridge High School in 2002 and studied music composition at Christopher Newport University in Newport News, Virginia, for a year, playing football there as well. He continued his musical studies at Tidewater Community College. Before Idol, Richardson was a kitchen supervisor for a Hooters restaurant. Chris plays guitar, drums and piano. His favorite male singers include Jason Mraz, Justin Timberlake, James Brown, and Michael Jackson. His favorite female artists are early 1990s Mariah Carey, and Christina Aguilera. He has a Bulldog named Tommy. Chris and fellow idol Blake Lewis had said on Chris' elimination night that they are best friends. On April 11, 2016, he and girlfriend, Maryfrances Jerez, welcomed a baby girl. Richardson had auditioned for American Idol in two previous seasons before being cast on season 6. Richardson auditioned in New York City, holding number 8963. The judges warmed to him, and he got through the audition process. Richardson was grouped with Paul Kim and AJ Tabaldo in the Hollywood group round. During American Idol, Chris received many comparisons to Justin Timberlake, including from judge Randy Jackson. But, he adds, those who've drawn the connection should listen to his album when it comes out and then decide if it still holds. "To be even mentioned in the same sentence as someone so successful, it's great," Richardson told the Associated Press on Thursday the day after his elimination in a phone interview. "They might be surprised whenever I come out with my album, that it's completely different than his. So that's when other people might one day be, like 'Hey, you sort of sound like Chris Richardson.'" ^Note 1 When Ryan Seacrest announced the results in the particular night, Richardson was in the bottom two but declared safe when Stephanie Edwards was eliminated. ^Note 2 Richardson was saved first from elimination. Richardson participated in the Season 6 tour along with the rest of the Top 10 after Season six ended. He started working on his debut album after the tour, then tentatively titled Come Right Back to You, which he said will be a mix of both rock, soul/R&B. "It'll be a mixture of a Maroon 5 sound with a little bit of Jason Mraz," said Richardson. "I love rock and roll but I have this soulful type voice and I just like to infuse both of them." On February 22, 2008, a new song leaked onto the internet from Richardson, entitled "All Alone." The song was then released commercially, being available on iTunes among other places. Richardson performs the song on over 30 radio/TV stations as part of his 10 city tour, sponsored by Breyers. On May 20, 2008, the album was put on the fast track and was recorded in Los Angeles, Miami and Virginia. Producers include Ill Factor, Brent Paschke and Troy "Radio" Johnson. Richardson co-wrote the track "What'cha Got 2 Lose?" on Blake Lewis' debut album A.D.D. (Audio Day Dream), as well as the bonus track "Human" released exclusively via iTunes. He has also said in an interview that he has written songs for winner Jordin Sparks and Phil Stacey and plans on writing with Gina Glocksen. On April 19, 2008, Richardson appeared as a surprise guest at Jason Mraz's "Music, Magic and Makepeace Tour." He sang a duet with Mraz called "Geek in the Pink". On March 20, 2009, Richardson was the opening act for Josh Hodge in New York City at the Canal Room, performing a couple of songs, including "All Alone." In May 2009, he appeared on the red carpet for the American Idol finale, as well as a "Relay for Life" charity event at Currituck County High School. He also sang in the ninth season finale of American Idol in 2010 with other seasons' finalists in a tribute to Simon Cowell's last show. In 2011, Richardson collaborated with Tyga on the single "Far Away". The single was released on May 17, 2011 and reached number 86 in Billboard Hot 100. In 2012, Richardson signed a record deal with Cash Money Records and Republic Records. In January 2012, he released the single "In the Name of Love" which was followed by a music video. Later that year, he released his official debut single "Joy & Pain" featuring Tyga on August 28, 2012. In mid-2012 it was announced that Universal Republic Records was going defunct, making Richardson and other artists move to Republic Records making the label itself revived. In 2013, he released two new songs "Collecting" and "Why You Mad" which were followed by a Kickstarter campaign in 2014 to help fund a mixtape and tour which did not make its goal. In 2015, he announced that he and YMCMB had parted ways and that he'd be releasing his music independently. Additionally, he announced work on two EPs: Press Play and Murder She Wrote. Later that year, he was featured on the international single "Bigger Better Faster" with Follow Your Instinct and Busta Rhymes which hit the Top 3 in Japan. On December 7, 2015, he premiered a cover of Bryson Tiller's hit "Don't" on his official media handles which garnered positive reviews. His new single "Rear View" will be released on February 19, 2016. ↑ Hampton Roads Archived September 26, 2007, at the Wayback Machine. ↑ "Chesapeake Idol contestant stirs up fond memories among friends, family" By Larry Bonko and Phyllis Speidell. The Virginian-Pilot February 6, 2007. Archived September 26, 2007, at the Wayback Machine. ↑ "Chris Richardson now with Republic Records". Retrieved November 24, 2012. ↑ "Tyga Album & Song Chart History: Hot 100". Billboard. Prometheus Global Media. Retrieved November 25, 2011. ↑ "Tyga Album & Song Chart History: R&B/Hip-Hop Songs". Billboard. Prometheus Global Media. Retrieved November 25, 2011. ↑ "Tyga Album & Song Chart History: Rap Songs". Billboard. Prometheus Global Media. Retrieved November 25, 2011. ↑ "The ARIA Report: Issue 1170 (Week Commencing 30 July 2012)" (PDF). Australian Recording Industry Association. p. 4. Retrieved August 6, 2012. ↑ "Tyga Album & Song Chart History: Canadian Hot 100". Billboard. Prometheus Global Media. Retrieved January 28, 2012. ↑ "Discographie Tyga". lescharts.com (in French). Hung Medien. Retrieved July 25, 2012. ↑ "Tyga". The Official Charts Company. Retrieved March 7, 2012.